Carol Corps Party for Emerald City Comic Con! 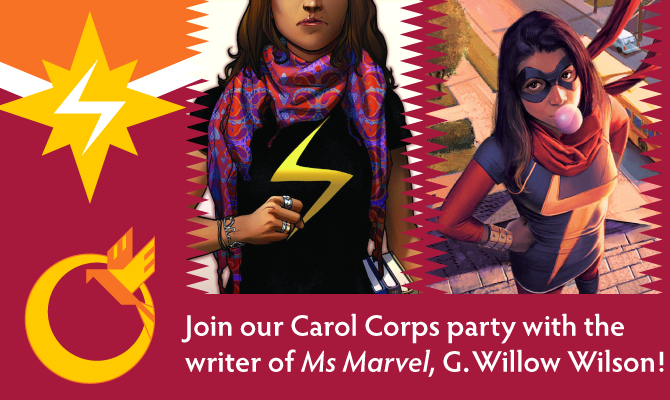 This Sunday, Phoenix Comics and Games would like to invite you to don the colors of Carol Danvers and Kamala Khan and join us for an afternoon of snacks, signings and of course, the Carol Corps! It's a party and every one of you are invited! Who's invited: You are! There's no Emerald City pass to buy, just come on in and have fun! Author G. Willow Wilson of Ms Marvel, Cairo and Air fame will be in the shop to sign copies of her books! We encourage you to bring your own copies or purchase some from us too. We'll have cupcakes (yes cupcakes!) and other more healthy snacks available for you to partake of while you converse with your fellow Corp members! Last but in no way least, we'll have a costume contest for those of you who choose to dress for the occasion! We'll have a number of prizes including copies of Ms Marvel #1 (signed of course) and Gift Certificates! The number of prizes will depend on the number of entries, so make sure to bring friends!